The Waldorf salad may be over a century old, but even today, it remains a timeless American classic. The apple and walnut salad was first created in the late 1800s at New York's legendary Waldorf Astoria Hotel. My first encounter with a true Waldorf Salad was in Home Economics. My Mother had a version of it that was popular in the 60's, that involved "Dream Whip"! Do any of you remember Dream Whip? It of course was sweet and my Mom loved her sweets. 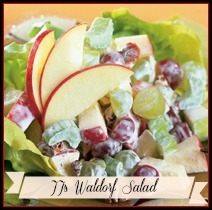 We had Waldorf Salad with Dream Whip about once a week! This is a dish that always makes an appearance during the holidays. My Mother or my Aunt Dottie always made sure Thanksgiving and Christmas dinner was over the top and always enough food to feed a small army - and that isn't even an exaggeration! I came from a large family where large meals came naturally for my Mom. She always seemed to pull it off so effortlessly. She did most of the meal herself, with my aunts helping filling in with some of the side dishes. At Christmas the big dinner was at my Aunt Dottie's house in the city, she cooked the mains and all the siblings filled in the sides. It was always great fun for all, The city folk coming to the country to ride horses and swing on the big swing, and the country folk going into the big city. As I got older, I helped out in the kitchen and one of my jobs was to cut up the apples, celery and walnuts for the Waldorf salad. Then, whip up the Dream Whip, sneaking a few finger full's into my mouth...yum! I loved helping her and I am so thankful for the memories and bits of kitchen knowledge I learned from my Mother, that I later passed onto my children or at least the ones that were interested! I have changed the Waldorf salad over the years, as our tastes have changed. This is my current version of the famous "Waldorf Salad"! JJ's Waldorf Salad 3/4 cup low fat buttermilk 1/4 cup plus 2 teaspoons mayonaise 1 Tablespoon plus 2 teaspoons cider vinegar 1 Tablespoon sugar 1 lemon juiced 3 Tablespoons fresh chives chopped salt and pepper 1 cup walnuts, lightly toasted and roughly chopped 6 ribs of celery, sliced 2 apples I use granny smith and gala, but, use what you enjoy 1 cup green grapes, sliced To make the dressing mix together the butterilk, mayonaise, vinegar, sugar, lemon juice and chives. Season with salt and pepper to taste, about 1/2 tsp of each. Pour half the dressing over the apple mixture and toss. Let the mixture stand for a few minutes, then toss again, adjust the seasoning. Add the remaining dressing, just before serving. Serve at room temperature. Are you hosting a Thanksgiving Dinner this year? Are you freaking out about how you are going to get it all done? Relax! It's not about putting on the "perfect" dinner party. Remember it's about gathering with family and friends and giving thanks. 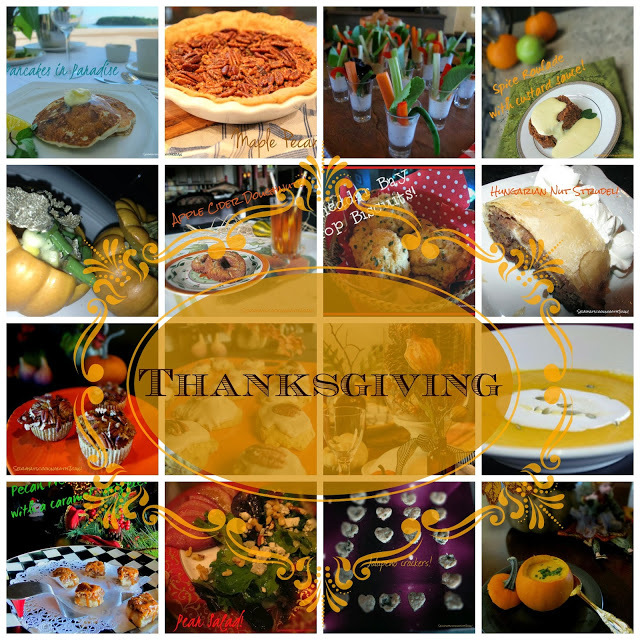 I have a Thanksgiving Wrap up menu that I am certain you will find ideas that will be perfect for your gathering. Drinks appetizers, sides and desserts, just click the Wrap up link! Wee Bear and I are spending our Thanksgiving in our Winter home in Scottsdale. We are having some of our Washington/Arizona friends over and I will be doing most of the cooking. Wee Bear had both his knees replaced on Nov. 10, so, he is recuperating. He is known as the "Rock Star" not only at home but, at the hospital. He was walking unassisted with zero pain meds on the fourth day after surgery, he's amazing! I am looking forward mostly to Thanksgiving morning with my daughter, son-in-law and my two adorable grandchildren because we are doing a "Turkey Trot" 5 K! It should be a lot of fun! 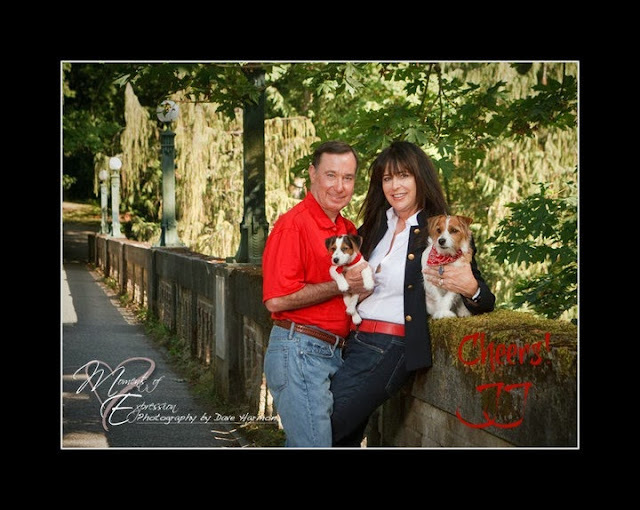 Where ever you are spending your Thanksgiving, Wee Bear, Moose, Bandit and I wish you a warm and loving Thanksgiving holiday! The Gobbler! Turkey and dressing Panini!